This past weekend, UHD pulled off yet another successful Open House for prospective students and their guests. More than 500 guests braved the rain and possible thunderstorms to attend. 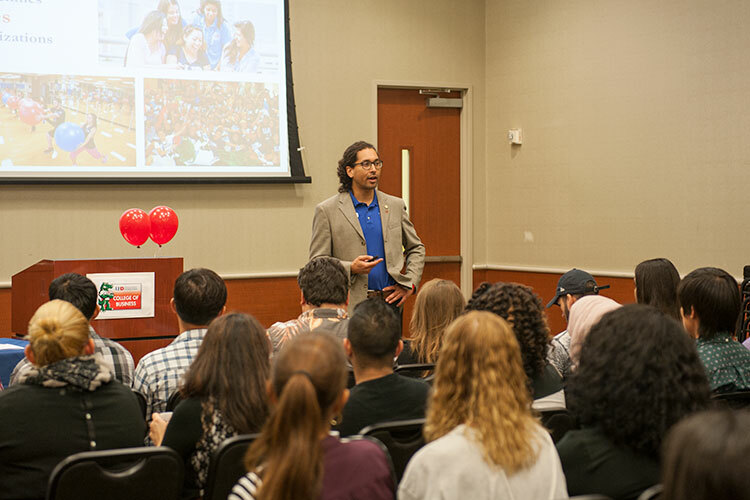 "In spite of the rain, the UHD community came together to discuss many amazing opportunities we offer at UHD," said Spencer Lightsy, director of admissions. "We had an excellent turn out, and from a few conversations with prospective students, I noticed they were serious about considering UHD as their college choice." Attendees learned about the overall application and course registration process, admissions, financial aid and scholarships — in addition to touring the UHD campus and learning information from each college. Students also had the opportunity to meet with faculty, current students, and representatives of student clubs and organizations. Lightsy also credits the Admissions Outreach team for their high spirits, enthusiasm and dedication. "By having shuttle buses in place due to the rain, our Ambassadors and staff insisted on riding with guests from the Vine Street Garage to the One Main Building," said Lightsy. "This enabled our team to speak with the prospective students in a more personal way, and created a great welcome before the guests even arrived at the check-in tables." The Office of Admissions seeks to continually improve the program, and has requested feedback. All attendees are invited to complete the Open House survey and share candid feedback about the event by Friday, Oct. 30.